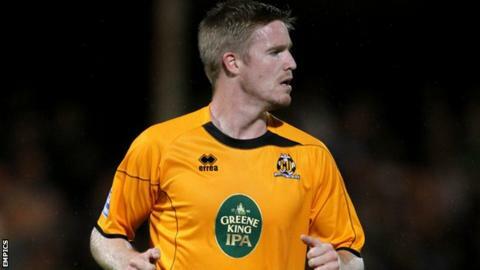 Joint top-scorer Michael Gash's shock move to Kidderminster made sense for Cambridge United, according to director of football Jez George. The 26-year-old left the club for promotion-chasing Harriers on loan with a view to a permanent deal on Monday. George told BBC Radio Cambridgeshire: "Once you have a player with only seven or eight weeks left on his contract you have to be pragmatic. "Realistically the overall package is one that is good for us." Cambridge have been negotiating with Gash since January about a new contract, amid interest from a number of other clubs, and George said the club had "done our best" in terms of trying to meet his salary demands. "It became evident the financial package he was looking for wasn't one we would be able to meet and the negotiations have sort of petered out a little bit," he explained. "In the last few days, he made it clear to us he wanted to go to Kidderminster. The way football works now, although he's a contracted player for us he knows of outside interest as quickly as we do. "You could say he's a contracted player and we keep him until the end of the season, but if we do he goes on a free and we have an unhappy player on our hands. "We have to look after Cambridge United in the best possible way, which is to get the best financial deal we can in the circumstances and try and cover ourselves off a little bit in terms of bringing a player in. "There is a loan fee involved, a payment up front and further payments depending on what Kidderminster do over the rest of the season. Young Kidderminster striker Nathan Blissett, who made the switch in the opposite direction on a one-month loan deal, will help cover for the absence of Gash and fellow forward Sam Smith, currently recovering from a broken wrist. "Nathan is a handful. People describe him as raw because he's come from a couple of levels below, but he's big, strong and quick and will be a good addition for us for a month while Sam is recovering from his injury," George added.